Our highly flexible Smart Gate XL adapts to your existing shelving/rack systems to give you superior value in a pick-to-light solution. While window sizes can be configured as small as 6” x 6”, they can also be configured up to 5’ x 8’ making this the ideal system for large parts, case lots, etc. It can be used for a single bin, wired in series for multiple bins, or interfaced .with one or more Smart Frames to create an extensive system. Like all SpeasTech pick-to-light solutions, Smart Gate is automated via our infrared windows to greatly reduce labor and errors. Control can be provided by Smart Product or Smart Pick Controllers, PCs, PLCs or mainframes for easy exchange of data. Available in 6”, 12”, 18”, 24”, 30” and 36” standard heights. Custom heights are available up to 60”. Window widths are up to 8’ as needed. Starting at only $395 per set! 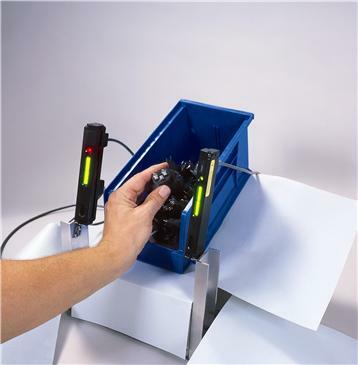 Infrared sensor detects good and bad picks, audibly alarms on bad ones. Mounts easily on existing shelving, rack and bin systems. Records completed picks for better inventory control. Compatible with Smart Frame and other devices. Smart Product Controller interfaces with equipment using RS-232 and discrete I/O. Smart Product Controller compatible with DeviceNet, Ethernet and other communications devices.